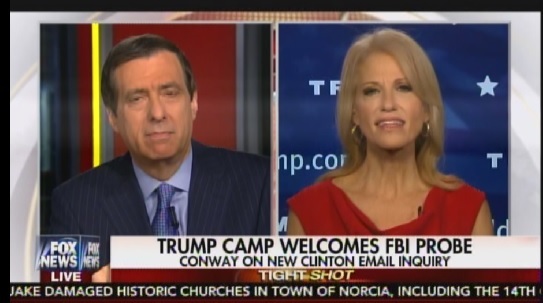 Trump Campaign Manager Kellyanne Conway went on with Howard Kurtz on Media Buzz on Sunday morning to discuss the current state of the race. Conway told Howie the stench of the Clintons will be with us for a long, long time. Kellyanne Conway: What we are reminded of is this cloud of corruption that always follows Hillary Clinton. And we are having this entire conversation about a renewed FBI investigation because Hillary Clinton did what she always does, put Hillary first… We can never get the stench and the stain of the Clintons off of us it turns out.